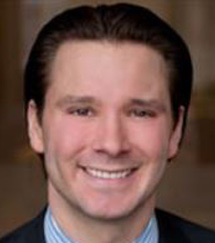 Patrick A. Salvi II joined Salvi, Schostok & Pritchard P.C. in 2007 and was named Managing Partner of the Chicago office in 2017. He concentrates his legal practice on cases concerning personal injury, medical malpractice and product liability. In addition, Mr. Salvi obtained a record-setting $4.5 million settlement on behalf of a man who was injured after falling from a balcony. The settlement represents the largest porch collapse settlement in Illinois history. Other verdicts include a $33.2 million verdict on behalf of a young man paralyzed in a motor vehicle collision and a $29.1 million verdict in a medical malpractice case on behalf of a brain injured infant. In recognition for his outstanding legal work, Mr. Salvi has been named to the Illinois Super Lawyers List since 2014, and was selected as a “Rising Star” by Super Lawyers in 2012 and 2013. Since 2015, he has been named to the Law Bulletin Publishing Company’s Emerging Lawyers, an honor given to the top 2% of lawyers in Illinois who are age 40 or younger or have practiced 10 years or less. He was ranked in the Top 10 for all Emerging Lawyers, regardless of practice specialty. In 2017, he was listed in The Lawdragon 500 Leading Lawyers in America, an elite guide in the legal profession. After he received his undergraduate degree in Business Administration from the University of Colorado, Mr. Salvi earned his law degree from the University of Notre Dame Law School. As a law school student, Mr. Salvi won an award for excellence in trial advocacy from the International Academy of Trial Lawyers. Mr. Salvi is a member of the American Association for Justice, where he sits on the Board of Governors and the AAJ PAC Board of Trustees. He is also an active member of the Illinois Trial Lawyers Association, where he sits on the executive committee, is a co-chair of the publications committee, and a co-author of the Medical Malpractice Trial Notebook chapter on Informed Consent. He has been a judge at ABA and AAJ trial competitions, as well as ABA Moot Court competitions. In addition, Mr. Salvi holds memberships in the Lake County Bar Association, the Chicago Bar Association, and the Illinois State Bar Association, where he is a member of the Tort Law Committee. Mr. Salvi formerly served as a board chair and continues to support St. Agnes of Bohemia Elementary on the southwest side of Chicago. Mr. Salvi has also been a speaker at Kellogg’s School of Management’s MBA business law class and at Notre Dame Law School’s “Personal Injury Litigation” class.